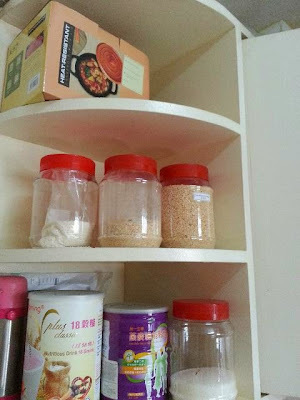 During the extended holiday weekend, I managed to do some minor rearrangements and did some cleaning and tidying up my humble kitchen. The heat resistant pot has been sitting on the very top shelve for a long while which I have no time to check on it. It was given by a friend of ours many months ago. Still new in the box. It is a very small and cute pot that I do not know what to do with it. 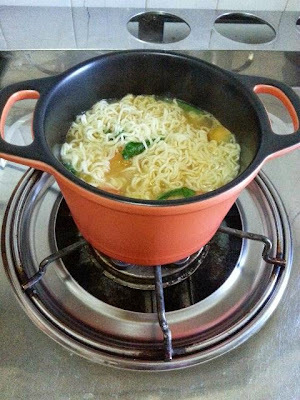 Too small to boil soup for the 4 of us. At the very moment, I can only think of cooking 2 packets of Maggi mee just enough for myself as breakfast. Since it is a heat resistant pot, it can be transferred straight from stove to table. 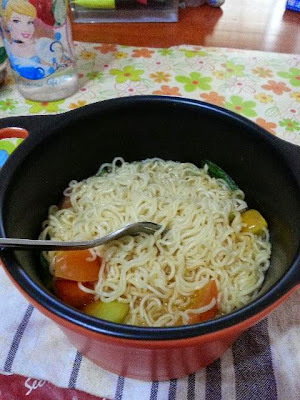 However, because of the heat retention, my mee became soaking very fast. 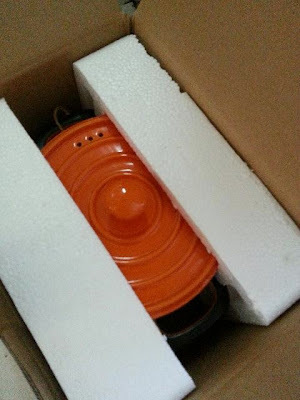 Nevertheless, it is a nice piece of cookware, the colour of orange itself adds colour to my dull kitchen. That is a lovely piece of cooking equipment especially when cooking for 1-2 person.